I know...smack on my hand...I'm as slow as a wet week getting this newsletter out again! My excuse is lack of time...again. (At least I'm consistent!) My poor old Mum has fallen down again and managed to do a compressed fracture of her spine again. So, full care has been needed for a while now to get the old girl up to steam. I can happily report that she's finally staring to get better now, so I've found a little time to send you the next Pyro Newsletter. Once again, I hope quality and quantity will more than make up for frequency. P.P.S. In the next Pyro Newsletter, we continue with the series of 'When the Market Stalls' Pt 3. BOOK REWIEW - GOURD PYROGRAPHY. A monthly FREE newsletter by Sue Walters with pyro news, tips, best pyro sites, updates, releases and more. Please subscribe in the box at right. Let me start this review with an observation and prediction. The business, the art, the craft, the popularity, the sales and the appreciation of gourd art is big now but will be huge in the future. Not only do gourds appeal to a wide range of tastes, they also appeal to a wide range of craft and art techniques. 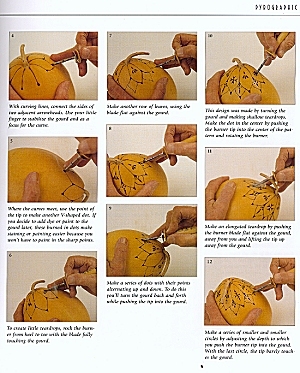 Regardless of what rows your artistic boat, you can pretty much be assured you can do it on a gourd. Not only that, but gourds are becoming somewhat of a collectors item and are beginning to sell accordingly. Pyrography plays a huge part in the decoration of gourds, being widely used in conjunction with other mediums or simply used alone to create unique and striking pieces of art. 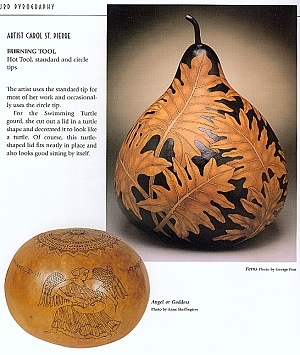 Author and gourd expert, Jim Widess has produced a 144 page, colour photo book that shows, explains and teaches us the art of gourd pyrography. 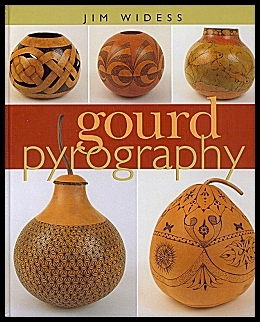 This is a comprehensive book that covers all aspects or gourd pyrography, and then some. To give you an idea of the contents and what I appreciated, let's take a little walk through together. Next, we see several artists at work as they take us through a variety of pyrographic projects, ranging from geometric, to realistic wildlife, to fantasy and even pyro carving a gourd. Here we see the first use of colour and learn many tips and tricks from the artists, including layout, transfer, painting and cutting the gourd to make a container. What I especially liked here was that no one single burning machine was favoured over another. Indeed, this was a feature to be continued in the extensive and impressive 'gourd gallery, with artists tips', which was to follow. Not only do you see glossy colour pictures representing an outstanding variety of gourd burning, but you also read about each artists unique approach and the machine and nibs they use. This is refreshing for those still feeling their way in the minefield than can be burning tool selection. For a change, the budding pyrographer, or person seeking to upgrade, can look and compare for her or himself. The burner range represented is extensive and includes Hot Tools, Razertip, Detail Master, Colwood, Walnut Hollow, Wall Lenk, Optima, Peter Child, Excalibur etc�even solar burning is given a run. This trend is expanded upon in the pyrography pen chart. Nibs representing Razertip, Leisure Time, Colwood and Nibsburner have been photographed and charted so the pyrographer can choose a nib they like the look of and compare it to what's available in their own brand. If your brand isn't here, I'm sure your supplier can help match a nib if you quote/describe what you see. Solid point nibs are also represented by Janik and Hot Tools�nichrome wire nibs by Pyrographic Equipment Manufacturing and Janik. The book then finishes with a list of suppliers relating to gourd supply in the U.S.A and Australia. 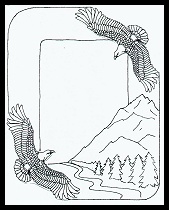 Pyrography related suppliers are listed in the U.S.A, Canada, Australia and Great Britain. The books physical makeup is hard covered, glossy, with clear text and tons of full colour, attractive pictures. All in all I found Gourd Pyrography to be a very enjoyable book. I'm sure I'll be returning to it many times in the future for further gourd inspiration. Now�if you'll excuse me, I have a certain hard shelled gourd I've been hanging to have a go at�.they can be a little adictive! Gourd Pyrography by Jim Widess can be purchased by visiting the PYRO BOOK SHOP. Contact Sue Walters if you have any inquiries. Those who would like to look at a preview of Gourd Pyrography can do so on this page. North Americans can purchase the book at the The Caning Shop. (Tell 'em Sue sent ya:)) Jim Widess can be contacted at the following email. For a good online read regarding gourds, please check out the Canadian Gourd Society and the American Gourd Society. You can email Sue if you would like advice on where to find gourds in Australia. For further Australian gourd information, and to visit the leader in Australian gourd craft, please visit Bronii Williams at Gourds Downunder. I've had several requests from burners to write a bio about my artistic career. I'm a bit embarrassed to do so because, well, there's really not that much to tell. Like any other kid, I took art in high school, but only until year 11. I've never taken an art class or any other creative class in my life since then. I have however been fortunate enough to have been blessed with parents who were very artistic and creative. My father (an architect) died when I was 5 years old, but there is enough of his work still existing for me to know he was an artist with a fantastic eye and natural ability. He loved black and white/monochrome work, as I do, and also loved to work in detail�as I absolutely do. On the same side of the family, my Great Grandmother was a well recognized oil and water colour painter and had a piece once hanging in our National Gallery. From my Mum I received a more rounded gift. She was (is, if she were still physically able) a creative jack of all trades. She taught herself many crafts and arts, including silver smithing/jewellery making, china painting etc. Apart from passing on a generous amount of artistic ability, she also taught me not be afraid to tackle anything I wanted to...and not to be afraid of rolling up my sleeves and getting my hands dirty. She was the only person to give me a drawing lesson. I remember she taught me what shade was and how it made a picture look more realistic. That was when I was very young, when I used to draw African animals from a book to while away the time at the laundry mat. I entered one of these pictures in a local art contest and won both the children's and adult sections for drawing. I taught myself a lot of other creative things in the mean time, including taking up my Mums love of jewelry making. I tried to paint once, but couldn't then find my niche or medium and quickly gave it up. I did a few pictures in pencil and tried some charcoal, but no sooner had I picked up a pencil, I would put it down again for a couple of years. For a career I studied and became a horticulturist. I worked in horticulture, (interspersed with travelling), for a number of years until I had to stay at home and look after my ill Mum. Well, every cloud has a silver lining as they say. While taking care of things at home I looked for ways to occupy myself. I started playing with a woodburner that had been given to me as a gift. At first I started burning simple products for markets and the tourist industry. I did this for a few years until Mum got super ill again and I couldn't keep up with orders. I then started to wonder about what was possible in pyrography...how fine and realistic could it be? While I had the home time, I started playing around and pushing my own limits, learning a whole lot of things along the way. That's pretty much where you find me now in pyrography...still pushing away, trying things out, developing methods to make the pictures I see in my head. My goal is to keep exploring the limits and to keep refining what I already know...and to pass that on to others who also enjoy burning in it's many forms. 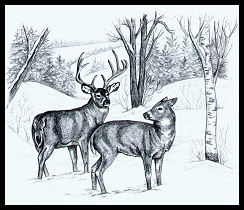 The off shoot of this is I've discovered my natural love of art again...especially wildlife art. I still continue to teach myself a variety of mediums and ache to learn about a thousand more. The last I've tried is scrimshaw on piano ivory, which I have loved doing. I have taken the plunge and bought some brushes and paint and have started learning to paint wildlife. (I'm surprised how much I have enjoyed it this time around.) I've only done a miniature on tagua and a small painting of an owl, but I am excited by the possibilities and am looking forward to the time I can do more. I'm actually looking forward to a whole lot more. The dreams are large and the possibilities seem endless. EASY TO USE AND MAKE WIRE NIBS. WHY SHOULD NORTH AMERICA HAVE ALL THE FUN? 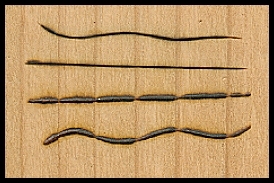 As many burners know, there is quite a bit of nib difference between the variable temperature wire burners of Australia/Britain and those of North America. I myself, being Australian, have a traditional wire nib burner that we most commonly see here and in Britain. I was aware the North American variable temp wire burners had nibs that came in a great variety of styles and seemed factory formed compared to my own. My burner required me to either buy a basic nib (a bent piece of wire) or form my own from a length of nichrome wire. (This nib resembles what North American burners know as the writing nib.) This metal nib is then attached to a handle in a variety of ways. Now, don't get me wrong, I'm not knocking the wire nib burners or the quality of work produced with them. The Commonwealth has produced some of the best known pyrographers and some of the best work we have ever seen. What I am suggesting is, by adding two basic nib designs to our arsenal, we can continue producing the same standard of work, but with greater ease and less frustration. To my thinking, the pens and nibs are the main difference between these two styles of variable temperature burners. I say this because, frankly, the power supply/temp control of the top Australian and British machines are of a very high quality and easily compete with the top North American counter parts. The North American handles are thinner than their counterparts, therefore easier to hold, but they can also get a lot hotter and be less durable, so the pros and cons cancel each other out. Let's quickly look at why burning is easier with a skew and shader in your kit, and why the Big Three are pretty much all you will ever need to produce whatever your heart desires. The Writing nib is the one that looks like a piece of tightly bent wire. It is essential to the burning kit because it's one of the few nibs we can push and pull. This makes it ideal for forming circles, wavy lines writing our names, drawing fat lines and filling in small areas of tone, like the eye of an animal. You can also use it to stipple, do pointillism work, cross hatch and a heap of other applications. It's one big draw back is burning a crisp line. Because it has a broard, round point, it either surfs across or gouges through the surface of wood. With patience and good wood/material, this is overcome. But on heavily grained wood, it can become a real brain ache. This is where The Skew comes in. The Skew is formed like a little knife. This mini knife can come in a few shapes, including a scalpel shape and an stencil knife shape. The shape isn't relevant to this discussion though....the blade is. What the Skew does is cuts as it burns, making a sharp, more consistant line. Think of your grainy wood as the surface of the sea. The Writer travels on Top of the water, surfing over the wave (grain), only to dig into the trough (soft wood) as it comes down. The Skew cuts Into the surface, travelling Through the wave when encountered...making transition to the soft wood behind more smooth. This creates a smoother, cleaner and much sharper line. Not only this, but it takes less time to burn the line and you have slightly better control because you are anchored into the wood a little. The Shader can also come in a variety of shapes, but the main principle is to have a nib that is wide, flat and smooth so you can burn larger broad strokes of tone. The Shader can be used in a mass of ways but some of the most common are: shading, gradual tones, portrait work, sketching and colouring in broad areas, like when lettering signs. Wire nib burners will well know the frustration of trying to fill in even tone or create shade if they have only been using a Writing nib up until now. All you could really do was a series of lines or circle tightly. Trust me, life will be much easier having a shader in your kit. So, now we know why it's easier to burn with the big three but how do wire nib pyrographers get these nibs? The wonderful thing about making your own nibs is you can let your imagination run riot if you have a hankering to make other shapes. It's important that you know what wire to buy. Paper clips and ordinary wire are a no go for transformers. Nichrome wire is the metal you need and what is always used in the making of pyrography wire nibs. This is the same type of wire that is used in bread toasters and heat conductors. If you don't wish to make your own nibs, you can always ask your original supplier if they have something that resembles a Skew, Shader or Calligraphy nib. (Writing nibs are always available.) Sometimes the companies will have a form of shader, but more rarely a Skew. Because of the demand for special nibs and having no where to direct people, I have started making my own range. They are primarily for Ironcore and ND1 burning systems but can be made for other units on request. The three standard nibs I make are: Skew, Round Shader and Calligraphy nib. The calligraphy nib is made with a square face and can be used in creative writing and also broad coverage and tone work. I also make 2 sizes of writing nibs. These 3 nibs are polished and ready for use at a cost of $15.95 Australian for the set. They should last you a few years with constant use. If you wish to purchase these nibs or nichrome wire, please go to the WOODBURNER SUPPLY PAGE. 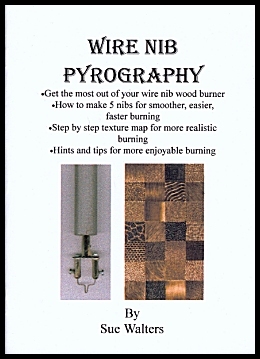 For those who would like to make their own nibs but don't know the process, I've written a chapter on this in my new booklet, Wire Nib Pyrography. Not only does it detail the steps in making your own Skew, Shader and Calligraphy nibs, (with pictures), but it also explains how to use them effectively. Via a detailed texture chart you will also learn how to create a myriad of textures to enhance and broaden your wire nib burning experience. Some of the textures and effects described in the Wire Nib Pyrography as seen in the Wire Nib Pyrography booklet. "I now have a couple of modifications available for the ND1 pyro-pen. I can convert your single pyro-pen to a dual tool, by installing an extra pen with a different nib and a change-over switch on the front panel. There will also be two more pen clips installed, to store the new pen safely. The whole conversion takes 24 hours and providing that you bring the tool to me in Kilsyth, it will only cost $88.00". "I can also provide a low-heat conversion for leather work, again installing a change-over switch on the front panel. This gives you the option of the normal heat range for wood, as well as a lower heat range for leather. This conversion again takes 24 hours and costs $44.00." "Just give me a ring on (03) 9724 9320, to arrange a convenient time for you to drop your tool off at my place for modifying." Many ND1 owners would have met or had contact with the warm and friendly Chris and Lis, owners of ND1. Sadly I have to announce that Lis lost her battle with cancer earlier this year. She will be sorely missed by the pyrograpic community. Chris is continuing to run the company, so the friendly advice and professional service of ND1 will continue. You can contact Chris at this email address if you have any questions. Our condolences to you mate. I'm burning a gourd for a friend of mine and I've been jotting down it's progress with a digital camera. I know we have a lot of existing and potential gourd burners on the list, so I thought I'd make a visual diary of this one, to be posted soonish. (Whenever I write 'soon' you have to factor in any number of thing that can go wrong in my universe, but I will try to post as soon as possible.) This diary will document a monochrome piece, much in the same realism technique as the elephant, seen below. I hope you all get a taste of this intriguing form of pyrography. Next up I hope to do a coloured piece, which should be interesting as I've never done coloured work on a gourd. Gourd burning is one of the options on the poll located on the TECHNIQUES PAGE. If there are enough people interested in gourd pyrography, I will be soon forming an online class and tutorial on this subject. Already there is a strong representation of people polled who want to see more gourd burning on site. The Pyro School Online isn't far away. To help me know what you are interested in learning more about, I've been running a poll on the TECHNIQUES PAGE. Please feel free to have a look at the various techniques and then let me know what you'd be eager to see and learn more of via the poll box, located in the middle of the page. (It's an anonymous poll.) Not only does this help me prioritize classes, but it also helps me to know what to focus on in the various sections of this site and in the newsletter. Nearly 200 people have responded so far and the results have been fascinating. I'd like to hear from as many of you as possible so I can better direct the site content. PLEASE NOTE: SUE WALTERS PYROGRAPHY HAS MOVED TO THE NEW LOCATION OF: www.suewalters.com. Please update your bookmarks...thanks. CALL TO NEW ZEALAND BURNERS Lots of Kiwi burners are feeling left out! I get a lot of email from Kiwis who feel they must be the only ones burning out that way. That can't be right because I get a lot of email from you all! I recently received a similar email from Stella Smith of New Zealand that prompted me to ask if she would like me to put a call out to her fellow burners from the land of the long white cloud. I thought it's about time we tried to hook some of you up if you are feeling alone and want to share experiences, recourses and info. You can contact Stella yourself at her email address if you want to make a N.Z. connection. A fun and effective material to burn with your pyrography machine is leather. Think of all the things you can do! Not only can you do decorative pictures on panels of leather, but you can burn functional items such as belts and knife holders. Leather requires an nice, soft heat. It's a joy to burn on because of the smoothness, but you must be sure to only burn on vegetable dyed leather. Chrome and metal dyed leather are no go burning zones because of toxic fumes. You can add colour to leather burning by using leather dyes. SAFETY WARNING: As a beginner, it's so difficult to know what to burn on and what not to. I mean, how would you know without being told?! Knowledge only comes from learning and sadly this information is not readily written about or passed around nearly enough. A material I hear beginners burning on (without knowing any better) is MDF - medium density fibreboard. This material should never be burnt on as it releases fumes containing carcinogenic toxins. I have heard of the odd burner condoning it's use despite the warnings, but really, the chances of a future cancer should not be dismissed.